Ralph Nader (see his RT interview video here) is providing a kind of leadership to the many Americans who are fed up with our dictatorship of the rich and who want a much more equal and democratic society. Nader's main attraction today is his "convergence" theme, by which he means that the great majority of Americans, on the order of 80%, want a more equal and democratic society whether they currently consider themselves to be on the "right" or on the "left." He's absolutely right about that. The problem with Nader, however, is this. The goal he urges people to aim for is one that will leave a very rich minority in the driver's seat and leave our society remaining very unequal and undemocratic. Nader's goal is to reform our capitalist society, to have fettered capitalism instead of unfettered capitalism, to have capitalism with some protections for the working class such as single payer health care and a higher minimum wage. This goal will leave unchanged the root cause of our many problems. The root cause is that our society is based on class inequality. It is based on the principle that there should be two very different classes of people. One class--the owning class--owns--as its private property--vast tracts of land, mineral wealth under the ground, factories both huge and small, office buildings both huge and small, and intellectual property (from computer software to patents on inventions)--in other words everything that is required for the other class--the working class--to produce all of the economic wealth of society. In fettered capitalism workers are only hired--only allowed to "earn a living"--if they work to make profits for the owning class. They are not hired to make life better for working class people. If profit-making was also good for ordinary people then, by golly, we'd have a veritable paradise in the United States today, wouldn't we? In fettered capitalism money is power; the owners have it and the workers don't. In fettered capitalism, where money is power, the owners use their money to control the government and in turn use the government to garner yet more money and power. In fettered capitalism the owners control the mass media and the schools and universities and they use them to persuade workers that society is a meritocracy and the working class people at the bottom are only there because they just happen to have less merit. This--fettered capitalism--is Ralph Nader's goal! He makes it seem like a worthy goal by contrastng it to unfettered capitalism. But fettered capitalism is not a goal; it is a state of war--a class war in which the working class is always on the defensive and the owning class on the offensive and armed with the power of money and control of the government. The goal is to WIN the class war. Winning the class war means creating a society without class inequality--an egalitarian society (described here.) 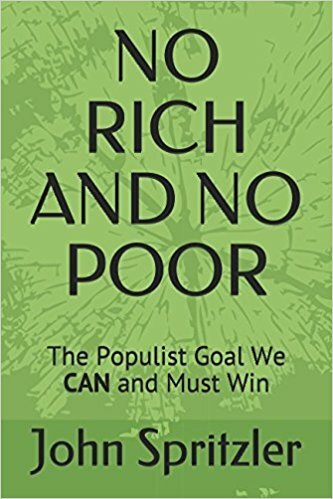 Winning does not mean fettering the rich, it means removing the rich from power and having a society with no rich and no poor, a society in which those who work reasonably share the fruits of the economy freely according to need, instead of buying and selling things to make a profit. It means having a society with real democracy, meaning that those who value equality and mutual aid--and only they--make the laws for their local community and decide how to use its resources and what is or isn’t reasonable, with larger scale social order and planning achieved by voluntary federation of local communities. THIS is a goal that gets at the root of our problems. Ralph Nader's fettered capitalism goal is absurd! It's like a man attacked by a shark saying his goal in life is to fetter the shark to limit how much of his body it eats. Nader Wants the US to be Like Sweden. What's Happening in Sweden? Nader's fettered capitalism is advertised as the way to "dismantle the corporate state." But that is an illusion. Fettering a state is not dismantling it. Sweden is famous for being a fettered capitalist state. To see how lame Nader's goal is one has only to take a look at what's happening in Sweden. "Some of Sweden's biggest companies are thinking of moving abroad to flee high taxes, threatening the country's Social Democratic government with a rise in unemployment and loss of tax revenue in an election year. "The list of companies said to be considering a move is topped by telecoms group Ericsson and industrial gases group AGA. Some firms, encouraged by mergers with foreign partners, have already left." "Instead of building capital, Swedes go into debt: 27 percent of Swedish households in fact have more debts than wealth, compared to between 16 and 19 percent in the US. With middle class wealth formation being held back by high taxes, Sweden has ironically developed a more unequal wealth distribution than the US. 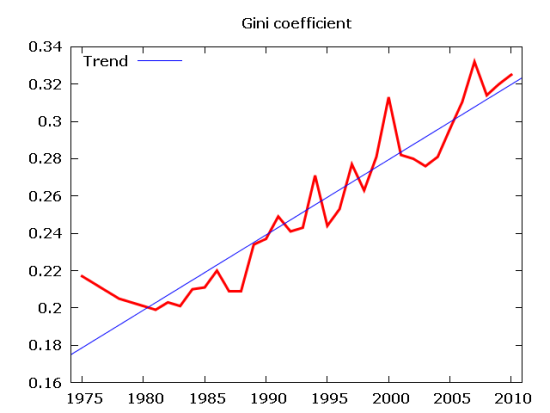 The Gini coefficient* for ownership is almost 0.9 in Sweden, compared to slightly above 0.8 in the US." "Inequality in Sweden continues to increase. "I would say that what we see happen in Sweden is deeply disturbing. The rising inequality has probably to do with income and wealth increasingly being concentrated in the hands of a very small and privileged elite." "The simple truth is that Sweden is not socialist. ... It's true that Sweden wasn't always so free. But Sweden's socialism lasted only for a couple of decades, roughly during the 1970s and 1980s. And as it happens, these decades mark the only break in the modern Swedish success story. "So reforms that increase economic freedoms should and will continue—the results so far have been more than encouraging. That is the real lesson to be learned from 'the Swedish model.'" And yes, Sweden's government sends Swedes to fight wars based on lies just like the United States government does. As a Swede newspaper headline from 2009 expresses it: "Sweden looks to boost Afghanistan force." The moral of the Sweden story is that the capitalist forces of inequality and of oppression to enforce that inequality do not give up. As long as they have an opportunity to increase their wealth and power they will attempt to do so. To succeed, all they need is for the fundamental values and principles of capitalism to be accepted, even if only passively by the failure of people like Nader to condemn them. What are these values and principles? That class inequality is proper. That a few very wealthy people rightfully own as their private property (instead of it belonging to all of society) the things that people need in order to produce economic wealth. That the goal of economic activity is to produce profits for the owners. That to ensure profits are made workers cannot object when they are made to compete against workers elsewhere instead of acting in solidarity with them. As long as these capitalist values and principles are merely fettered and not explicitly rejected, the capitalists know they are in the driver's seat. Ralph Nader's goal leaves the capitalists firmly in the driver's seat. To actually prevail over the capitalist forces of class inequality will require great energy and sacrifice by millions of people. Unless the goal is a truly inspiring goal--an egalitarian society--it is unlikely that enough people will make the required effort and take the required risks. Why would they? Why risk a lot to merely fetter the class enemy and allow it to stay in the driver's seat? Some people will jump on Nader's "fetter capitalism" bandwagon out of naiveté, believing that a modest effort and little risk will win single payer health care and similar reforms. When they fail, or when they succeed only to see what they won taken away afterwards because Big Money remains in the driver's seat (as the New Jim Crow is taking away what the Civil Rights Movement won, and the Iraq and Afghanistan war took away what the anti-Vietnam War Movement won, and job outsourcing has taken away most of what the Labor Movement won), when they discover, in other words, that they have been chasing a "quick fix" illusion, they will either become hopeless about being able to ever win anything substantial, or they will realize that the only way to really make a more equal and democratic world is to aim to win the class war and create an egalitarian society--no matter how hard that may be. How can we start building an egalitarian revolutionary movement starting today? A good start for those in the United States is to join the effort described at PDRBoston.org.